At the Verzamelaars Jaarbeurs 2016 in Utrecht (NL) I bought a nice Japanese pig piggy bank. I have a few of these already, all with ‘Foreign’ stamped on the belly bottom. This means that they were imported in the UK or US. They are reasonably old. The stamp ‘Foreign’ was used due to legislation before 1914. 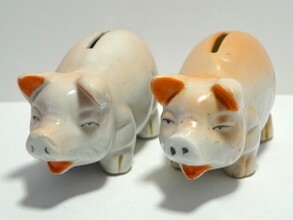 On US websites this type of piggy bank with the smiling face is identified as Japanese and undoubtedly brought home by American troops as a souvenir. My addition puzzles me since I now have got 2 of one kind with differences: 1. My old one (left on the photo) has Foreign on it, the new one does not; 2. Old is made of earthenware, new is porcelain; New is more carefully colored and came out the mould sharper (which suggests that a new mould was used). The question (for me) is now: Which pig piggy bank is the older one? My guess is that the one with ‘Foreign’ on it (before 1914 is the oldest and that my new one could be dated between the Great and the Second World war. The porcelain one is more beautiful…..